Inconspicuously located at the corner of King St. and Devine, the Mediterranean Tea Room specializes in Middle Eastern and Greek cuisine, with an emphasis on freshness. Pumping new life into Columbia’s struggling olive oil and chic pea industry, this healthy-minded eatery provides a wide variety of very fresh and flavorful dishes infused with the flavors of garlic, lemon, and olive oil, with a side of hummus and pita bread. Ever thought the menu at Zoës was lacking? Then this is your place to find an array of new dishes inspired by a variety of cultures around the Mediterranean Sea. Ah, the Mijadarah. Good luck with the pronunciation. One would think that this a spell straight out of Harry Potter for whipping up fresh delicious meals. 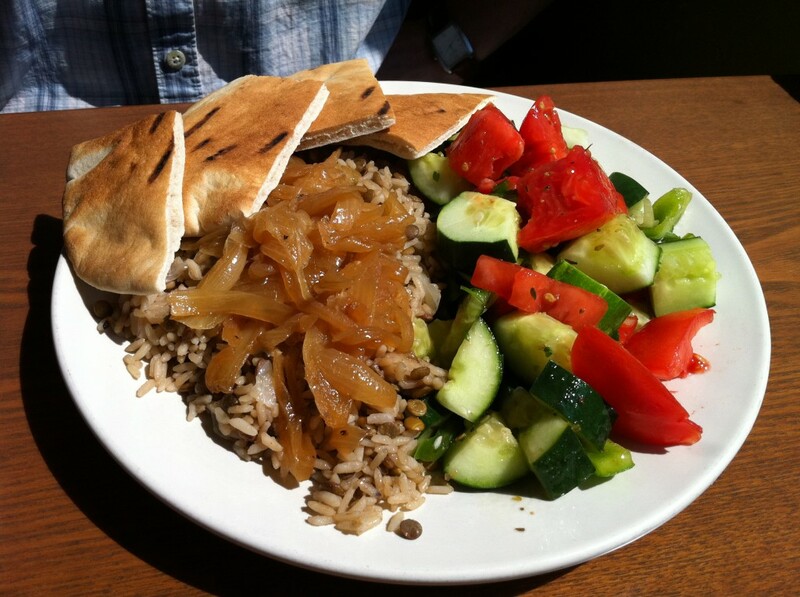 Rather, it is a combination of lentils and rice, seasoned with cumin and topped with caramelized onions, flanked by a falaheen salad and pita bread. The falaheen salad, which could constitute a meal entirely on its own (and does, look under salads on their menu), is a combination of chopped tomatoes, cucumber, bell pepper, green onions, and parsley, dressed with extra virgin olive oil and lemon juice. This dish can be enjoyed with a fork, but I prefer to stuff a little of everything into a pita pocket, soak up a bit of olive oil, and let my utensils rest while the contents of the pita pocket put on an tasty show of teamwork. Next up is the Chicken Gyro. Not listed on the menu, but an occasional special. Which came first: The taco or the gyro? Maybe we will never know, but this mediterranean cousin of the soft taco certainly was delicious. Grilled chicken, tomato, and tzatziki sauce, and in this case, a side greek salad. All sandwiches come with your choice of falaheen salad, middle eastern potatoes, tabbouleh or greek salad. 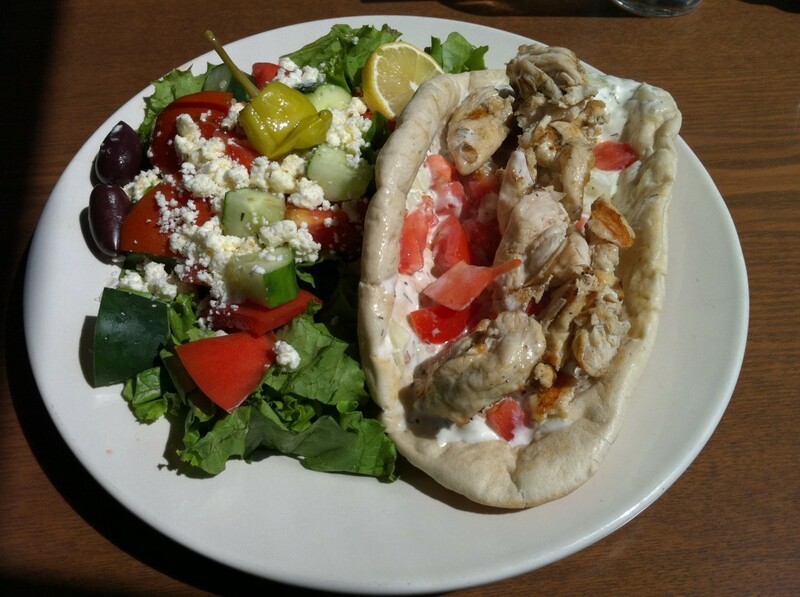 The Mediterranean Tea Room offers very fresh, colorful, healthy, and appetizing dishes. It is unique among Columbia, SC restaurants for its health-centric menu. Unfortunately we have only had the opportunity to sample a couple of the menu items, but will be back for the likes of the “Kofta Kebob”, the “Falafel Plate”, and the “Eggplant Pita Pizza.” Truly a place where you will leave felling good about your meal. “Like” them on facebook or check out their menu here.